One of the many charming things about a CH cat is that in spite of his wobbles, he usually gets to where he wants to go. Most often this involves climbing to his destination, instead of jumping. Although this isn’t the case with all CH kitties, it does seem to be more common with cats who have moderate CH. This is most likely because they don’t have the hind-leg strength or coordination in order to jump accurately. Our home is mostly a climb-up, jump-down home. Our cats tend to climb onto our couch, bed or their cat condo, but jump down, which often results in a ker-plop and bumping their jaws on the floor. There have been times when we’ve seen one or the other jump onto the bed or couch beautifully — but it’s often when they’re enticed by a toy and don’t appear to be thinking about it. However, since most CH cats are relatively unaware of their limitations, it’s up to us pet parents to watch out for them and to make their adventures that much safer. If the couch or bed’s material isn’t an ideal climbing texture/fabric, try covering the end of your bed or part of your couch with a heavy blanket (that can be tucked under your mattress or in your couch) that your cat can climb. You’ll want to tuck in the blanket so your cat doesn’t pull it off your furniture and fall. Likewise, you’ll want to move all cat beds and pillows from the spot where your cat likes to climb — just in case your cat grips on to one and falls off. I’ve also heard from some CH parents who strategically place their bedside chests a certain distance from their beds. One CH cat parent from the CH Kitty Club Yahoo! Group said that her CH boy climbs up the bed by using the bedside chest as a back support! You can place a step stool, cat stairs, or ramp in a convenient location so your cat doesn’t need to climb as high. You can also strategically place floor coverings around your home. Most often these can be placed where your cat tends to jump down, so he can gain some traction on landing. 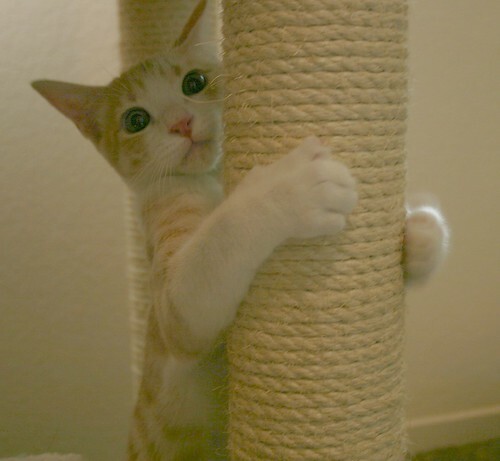 You may want to reconsider how much you clip your cat’s claws; this can often impact your cat’s ability to climb. If your cat’s really into climbing, I’d suggest having furniture and coverings that 1) You don’t care too much about and 2) Don’t show claw marks. Consequently, this may mean that buying a leather couch or that gorgeous bed comforter isn’t the best idea — at least if your CH cat may want to climb them. Lastly, try to position climb-able furniture away from high or dangerous places they can reach — not to mention enticing destinations. This could include kitchen counters, bookcases or end tables with delicate objects on them. Does your CH cat climb or does he jump? Do you have any climbing advice for CH cats? Please share in the comments! Dotty can jump up to the couch or bed most of the time now, but she also depends on her claws for climbing when she needs to. She can’t jump up onto chairs or tabletops. She can, however, find other ways to climb up onto chairs that have padded seats, and then up onto the kitchen table, get behind the stereo cabinet, climb onto the old record albums back there, and up onto the top of the big cabinet, and climb onto some plant stands via some shelves and up onto a way-too-high piece of furniture covered with plants in the window, which she then wreaked havoc upon. I’ve been moving furniture up to the attic and “baby”-proofing the place as she keeps climbing–she just has this urge to climb higher and higher–she is a cat, after all! But she’s too much of a klutz once she gets up there! Great article, some very good points. My CH cat is a jumper and a climber, just not an accurate jumper, so she sometimes overshoots her target! I’ve made steps so she can get up to the low windowsill perch and we also have padded areas where she jumps off of. I also made cat tree/condos that are not tall so she can climb into them and play or hide. Maggie is a great jumper, just a really, really bad aim-er. She may jump twice as high as she needs to to land on the bed, but still ends up on the floor because there was no forward momentum! One time she was trying to jump onto the arm of a recliner, and actually jumped over the chair and landed on the other side. What amazes me though, is that several times I have found her on the top bed of the bunk bed (her ‘normal’ brother’s ‘tree-fort’). I know she can’t jump up there like he does, and as far as I can tell, there is nothing good to climb on. But I’ve yet to catch her in-the-act, so it remains a mystery. Sascha is a fantastic climber. He’s 13, has been climbing since he was about 6 months old, and now has otherworldly upper body strength. A couple of times I’ve seen him rear up on his hind legs and swat Spooky (non CH) while play-fighting and Spooky sprawled to the floor like a boxer getting KO’d by a right hook! He may have CH, but there is no doubt Sascha is the dominant cat. I concur about the helmet. I’ve seen him slam his head so many times. I do my best to make the environment safe, but sometimes there’s just no preventing it. It usually happens when he leaps off the bed or couch and misses the rug or stool, making him lose traction on the hardwood floor, but a few times he’s just leaped way too far in a completely wrong direction. Speaking of traction, one of the funniest things is when he gets startled or excited and tries to run fast on the hardwood floor. It’s like something straight out of Looney Tunes! Cassie will claw her way up if there’s a blanket hanging off the side of the bed or back of the couch. She also jumps, whereby she launches herself upwards with her back legs and is able to jump almost straight up about 20 inches. She can’t seem to get much forward momentum though. We have made our cats a window perch with a ramp going up to it and Cassie will jump down from the perch, sometimes landing well and sometimes with a flop. When she was younger we taught her to climb up a 36 inch cat scratching post to get to the top of the window ledge, but since she has matured to 12 lbs she doesn’t want to do it anymore. Her front legs are not very strong. It’s so cute to see her play with a toy mouse. Her little leaps completely miss the mouse and she ends up with it underneath her tummy instead of capturing with her paws.